On March 5th, Governor John Bel Edwards signed a proclamation declaring March 5th-9th 2018 School Breakfast Week in Louisiana. 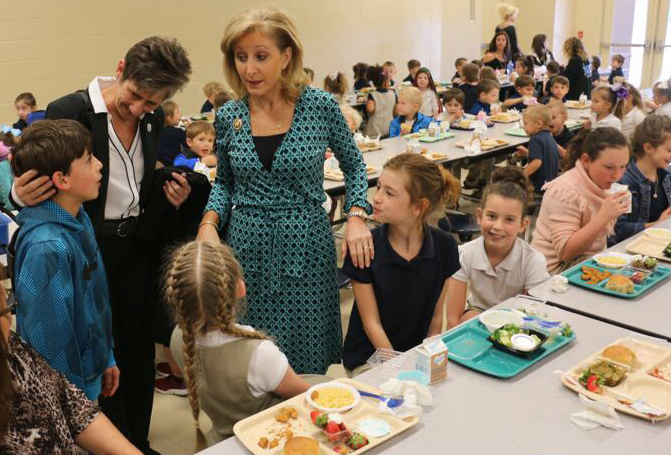 On March 7th, Louisiana's First Lady, Donna Edwards, announced the winners of the No Kid Hungry K-12 School Breakfast challenge at North Corbin Junior High in Walker! Five regions and 306 schools statewide participated in the challenge. The top schools in each region with the highest breakfast participation received $1,000 in cash prizes. The challenge was to increase average daily breakfast participation in October 2017 compared to October 2016. North Corbin Junior High K-8 (61% increase) and French Settlement High School (55% increase), both in Livingston Parish, had the highest increase in breakfast participation in the state. Because of this incredible accomplishment, students at these two schools were awarded a New Orleans Saints Pep Rally with a very special guest: New Orleans Saints Running Back Trey Edmunds! Prizes were donated by the Dairy Alliance, Share our Strength and the NFL through the “Fuel up to Play 60” program. “Both my husband, the governor of Louisiana, and I would like to encourage all schools across the state to make school breakfast a priority! Together we can, and we will end childhood hunger across the state of Louisiana.” – First Lady Donna Edwards. The goal of the No Kid Hungry Louisiana Breakfast Challenge is to inspire schools across the state to increase student participation in school breakfast. Research shows that students who eat breakfast do better in school. According to Mrs. Sommer Purvis, the assistant supervisor of the Child Nutrition Program in Livingston Parish, new models such as “Breakfast to go,” “Breakfast in the classroom,” or “Second Chance breakfast” were implemented in 25 schools in hopes to increase participation. In the past year, Livingston Parish served 1.8 million breakfasts. “Studies show that students who eat school breakfast are more likely to have higher levels of achievement in math, score higher on standardized tests, have better concentration, memory, focus, alertness in class, improved attendance, behavior, and overall academic performance. “- Dr. Dana Hunter, Louisiana Children’s Cabinet. The challenge was a success with schools in all 5 regions increasing breakfast participation! With a 60% increase in breakfast participation during the month of October 2017, the grand prize winner is North Corbin Junior High School (Livingston Parish)! In addition to the Regional and Grand Prize winners, those participating schools who achieved 70% or above breakfast participation were designated as members of the Louisiana Breakfast Challenge Hall of Fame.